The coach hit balls harder and farther afield – up the middle, deep in the hole. The kid tracked them down. Several times Schwartz felt sure he would need to slide or dive, or that the ball was flat-out unreachable, but he reached each one with a beat to spare. He didn’t seem to move faster than any other decent shortstop would, and yet he arrived instantly, impeccably, as if he had some foreknowledge of where the ball was headed. Or as if time slowed down for him alone. After each ball he dropped back into his feline crouch, the fingertips of his small glove scraping the cooked earth. He barehanded a slow roller and fired to first on the dead run. He leaped high to snag a tailing line drive. Sweat poured down his cheeks as he sliced through the soup-thick air. Even at full speed his face looked bland, almost bored, like that of a virtuoso practicing scales. He weighed a buck and a quarter, maximum. Where the kid’s thoughts were – whether he was having any thoughts at all, behind that blank look – Schwartz couldn’t say. He remembered a line from Professor Eglantine’s poetry class: Expressionless, expressing God. And to think, they call soccer the beautiful game. For me, it’s always been baseball, baseball with its convoluted rules and its arcane statistics, with its blatant self-regard and its reverence for its own history. Baseball, with its traditions, with its deep flaws, may they never change. You could fairly call baseball the most literary of sports, and again a young man has turned to baseball for the structure of a novel. In the above scene from the first chapter, Mike Schwartz, catcher for the Westish College Harpooners, chances on the highly talented Henry Skrimshander, shortstop for a no-name high school from a tiny town in South Dakota, and decides to recruit him to play for Westish. There, Henry develops into a big-league prospect, but one bad throw changes not only his life but four others. 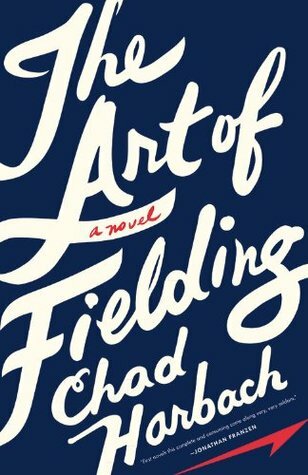 Chad Harbach’s The Art of Fielding is one of the better first novels I’ve ever come across. There’s something conspicuous about Harbach’s promise, and in that he’s much like Henry Skrimshander, the kid who impresses without meaning to, without trying, just doing what he does every day as if there was no other way to do it. Harbach’s material is familiar, which is not to say his take is unoriginal. It’s a college story, where the lives of five people intersect for a time and leave each other forever changed, which in some ways is the story of every person who ever went to college, yet Harbach makes more of it. It’s about the bonds of friendship and of love, love between parent and child and between man and woman – and, indeed, between man and man, both the fraternal and romantic varieties. It’s about commitment – to others and to one’s self. It’s unmistakably a product of its moment, reflecting college life as it is today (complete with the term freshpersons, which induces a man my age to roll his eyes), but something about it feels outside of time, too, dealing as it does with the things humans can never escape, nor should we try. He isn’t cynical. There is no meanness in his spirit. He doesn’t lean on irony, or dwell on just how terrible to each other we really are. His characters are good people to the last, and even though their judgment could have been better, even when they fail themselves and each other, he holds out hope for them, and in so doing, for all of us. When I turned the last page, I closed the book with a satisfied smile and the sense that these people might just be all right in the end. Beneath this novel’s skin there beats a warm heart, a romantic’s heart, full of hope and the desire for love for himself and everyone. I hope it never cools. Harbach writes with a light touch, never showing off, but his skills are on display at every turn. He’s drawn praise from the likes of Jonathan Franzen and Jay McInerney for his formidable gifts. Myself, for the way he makes such a common story feel epic, I’m reminded of Michael Chabon’s The Mysteries of Pittsburgh, which is not something I say lightly considering what Chabon has done since. If there’s a criticism in that, it’s that Harbach’s chosen subject seems narrower and smaller than his potential, just as The Mysteries of Pittsburgh, though excellent, was a much less ambitious undertaking than Chabon’s later work. But I have every reason to expect greater things from him, and look forward to his next novel. After 10 pages, I sadly realized that our nation’s hunger for the deconstruction of John Larroquette’s breakout prosecutor character we’ve all been patiently awaiting would, like a Judge Stone attempt at magic, have to continue unabated. Write to us. Or write for us.